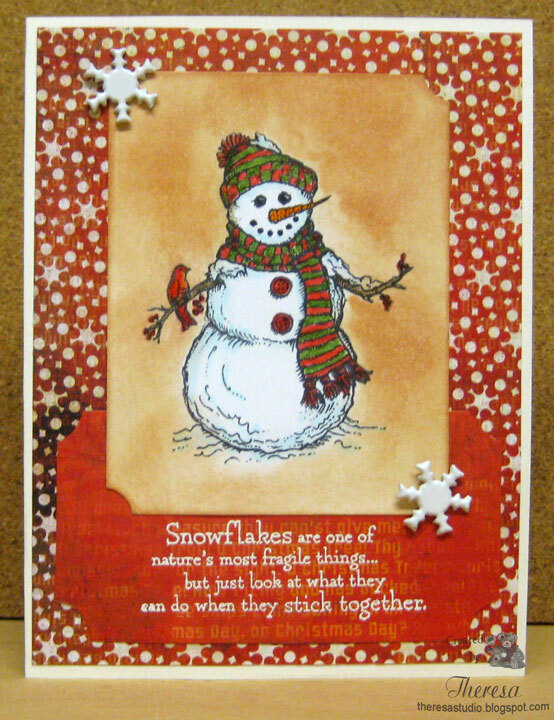 More Challenges for "Christmas in July"
Another snowman card for Christmas using Flourishes " Warm Winter Wishes" stamp set. I changed up the color theme a bit using distress ink background around the snowman. Stamps: Flourishes "Warm Winter Wishes"
﻿ Wishing you all a great weekend. Welcome to my second post today. Again, I am using a digital image - this one is from Mo Manning called "Pool Party" but I am taking her to the beach. Colored her in Copics and added Glossy Accents to her Float, Water Wings, and Tube. Thought this paper from my stash was perfect for a beachy card. For Fun Challenges: The sun of it all- Show us the fun of summer by showing us the sand/beach. Paper Pretties Monday Challenge: Make it shine...hope you can see the shine of the Glossy Accents. Digital: Mo Manning "Pool Party"
I have been playing with some digital images. I used Meljens' Garden Birdhouse and combined it with a sketch (turned 180 degrees) from Sweet Sunday . DYSU Challenge: Use wings...the little birds on the birdhouse flew there with their wings. Craft Us Crazy: Anything goes. Fussy and Fancy Friday: Theme is summer...birds and flowers are a fun part of summer. Digital Tuesday Challenge: Gardens with things with wings is theme challenge. We have enjoyed so many baby birds at our bird houses and feeders this summer. They are a joy to watch. 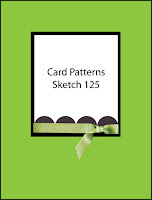 This week There's Magic in the Air has a sketch challenge. I was a bit confused by where the artist's back ground for the sketch ended or if the entire picture was the sketch. I chose to use the grey shaded portion as the sketch and considered the "Pages" as the artist's sketchbook that she used to feature her sketch. 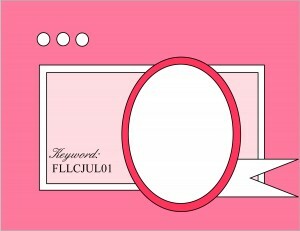 My card features "Simple Pleasures", a digi from Paper Cupcakes. I used 3 Pattern Papers from stash and Yellow CS. Used Blossom and Circle Nesties Dies to cut the base of card and Mats. Printed the image on white CS and colored with Copics and cut out with square Nesties but free cut the balloons extended outside the square. Added some glitter with Sakura Clear Star. Finished with yellow satin ribbon and an Epoxy sticker. 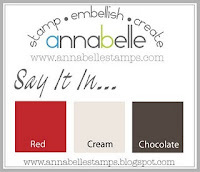 Another card for Annabelle's Say it in... Red, Cream, and Chocolate Challenge and also for s challenge at Card Positioning Systems. Thought this pattern paper was perfect for the colors in the challenge. 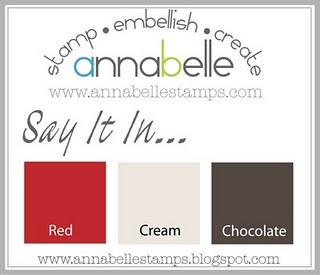 Stamps: Annabelle Sentiments from "All Things Grow"
Sentimental Sunday: For men in your life...Thought the colors, design and paper were good for a manly card. Back with another cool Snowman to cool down this summer hot day...I think he is so cooool!!! 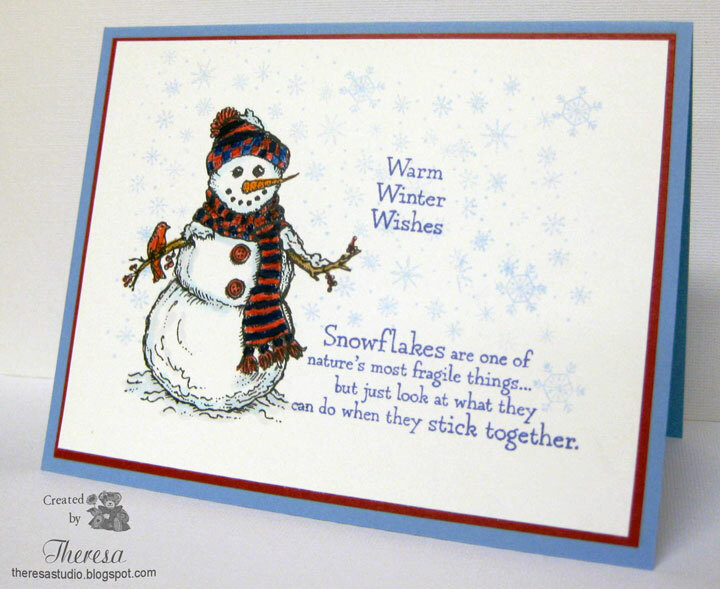 Love this Flourishes stamp and all the snowflakes stamp in the set "Warm Winter Wishes". 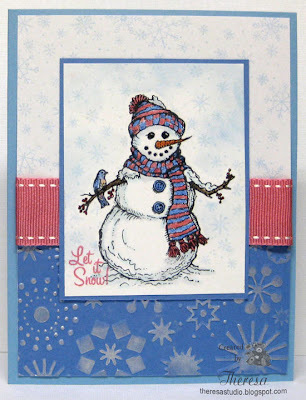 Made the background by stamping flakes in blue on white CS and used embossing folder on the lower part of blue CS. Highlighted the raised edges by rubbing with Brilliance Platinum Planet. Colored the image with pencils and copics, sponged the sky and added snowflakes. I made the bird a blue bird to go with the colors that I chose. Finished with a sentiment and ribbon to match. Other supplies included Memento Tuxedo Black and Summer Sky Inks, SU Rose Ink, Cuttlebug EF Snowflakes. 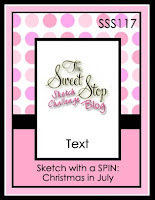 The Sweet Stop: Sketch 117 shown with a spin of Christmas in July. Jellypark Challenge: New- First Challenge. Theme is Christmas in July. Really Reasonable Ribbon: Theme is cool it! Snowman may not be what they had in mine at RRR, but what could be cooler? 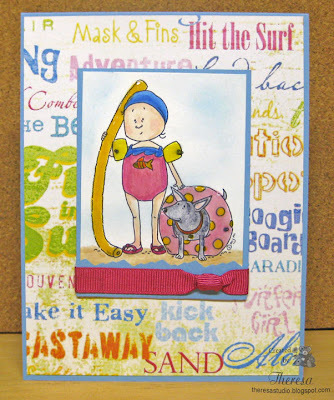 Kaboodle Doodle Challenge: Challenge is embossing. 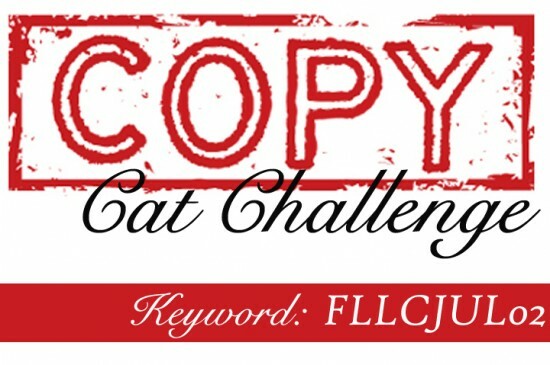 My DH just loves the name of this challenge so I have to enter here to make him smile. Paper Cutz Challenge: Anything goes. Keep cool if you are in the hot zones. I seem to be making more and more square cards but I need to make some envelopes so that I can mail them. This card is for Speedy the Cat's Friends color challenge. One of my favorite MFP's Stamps is Happy Pansies that I use a lot and used again. I found the sketch from One Stop challenges for a design but changed the oval to a circle since I wanted to use the doily that I had precut. Speedy the Cat's Friends: Lori wants you to make a cheery card using yellow, pink and green. BasicGrey Challenges: Doilies and ribbon. I have both of these and Sweet Threads from BasicGrey. 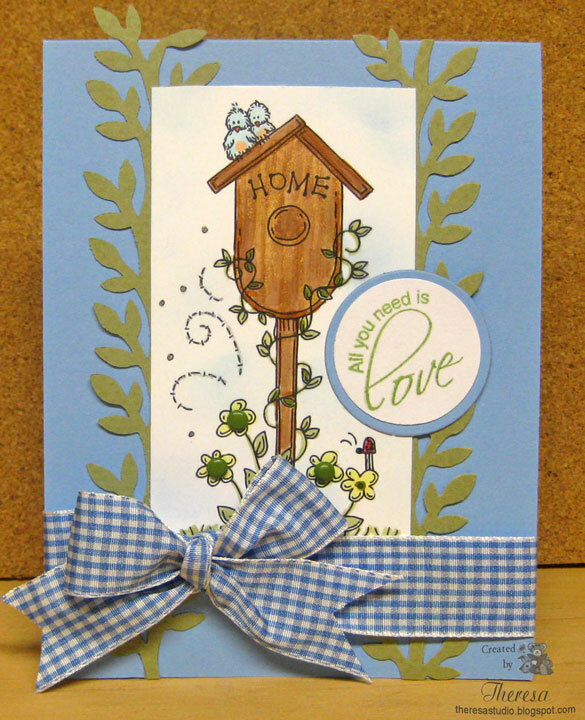 One Stop Craft Challenge: Used Val's sketch shown above. Cheery Lyn Doily Die "French Pastry"
To keep us cool during this heat wave, many challenges are turning to Christmas in July for a theme. 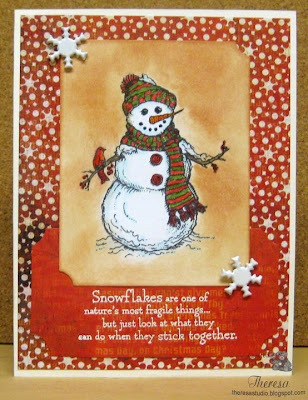 I made this card with a Flourishes set that I just won and received yesterday....has the cutest snowman and snowflakes. Colored it with a mix of markers, pencils, and copics. Used red, white, blue theme. Stamp Something: Christmas in July. 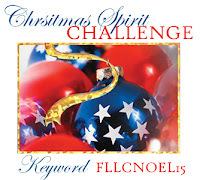 Christmas Card Challenge: Theme is Faith/Christmas In July. but any Christmas will do. 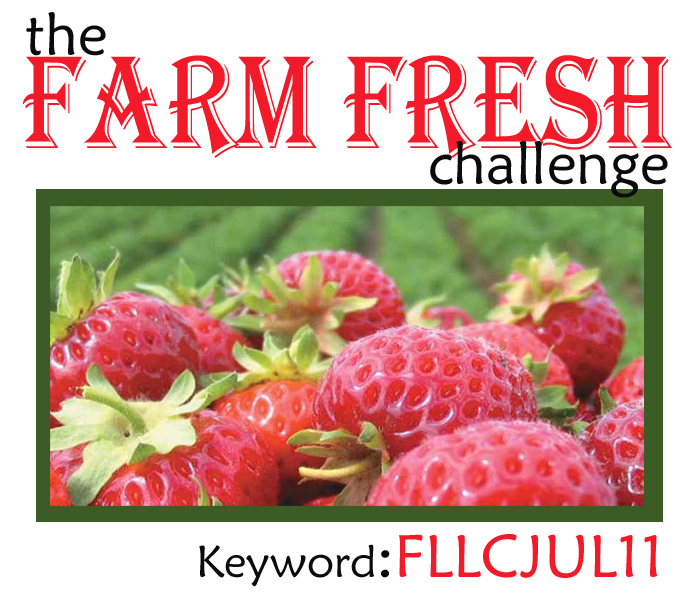 Delightful Challenges: Christmas in July. 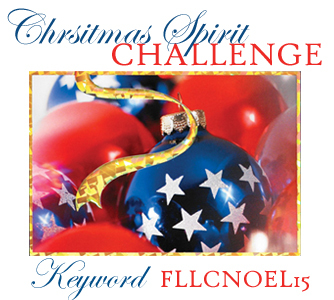 Flourishes Christmas Spirit Challenges: Use red, white, and blue...second entry. 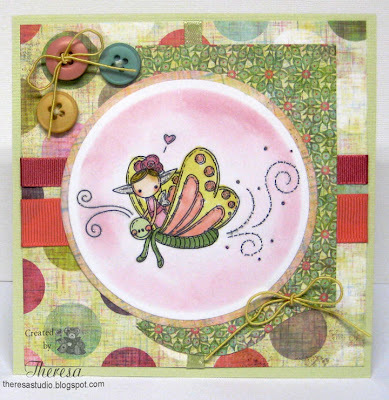 This card features a digital image from Meljens Designs called Flutterbye Fairy. Their challenge this week is to use buttons and bows. I had fun with the colors on this image which I did with Copics. 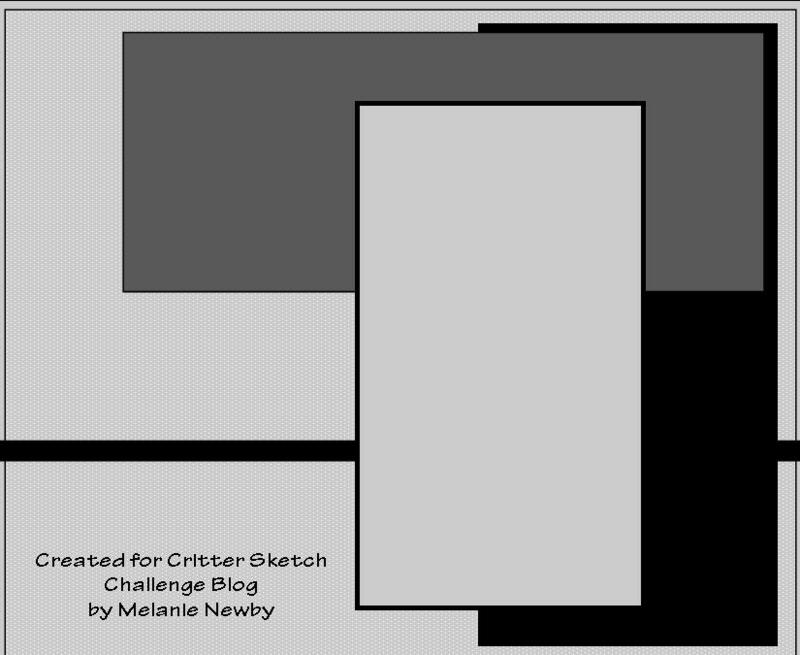 Digital Tuesday Challenge: Use sketch shown below. For Fun Challenges: Use 2 different ribbons. Actually have 3. Stamp and Create : Use ribbons and bows. At Stamp TV, the Free For All Friday challenge is to create a Clean and Simple card that can easily be recreated in 10 minutes or less. 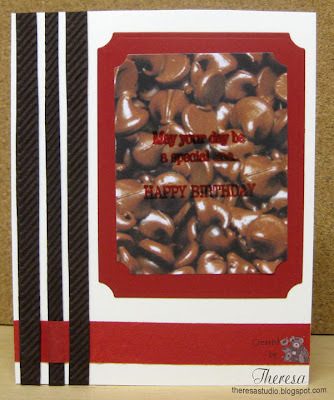 I made this one using GKD's Lovely Labels Stamp Set by Nina and Spellbinders Label One dies. 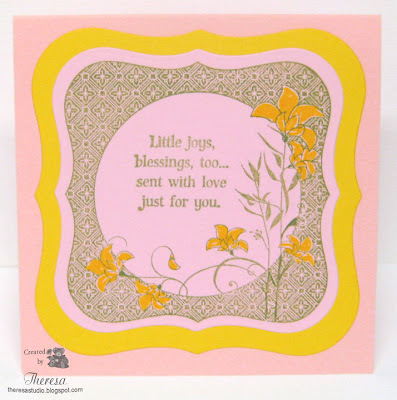 Used Pink CS as Base card, Yellow CS cut with Label 1 die as a mat under the stamped image that I stamped with Memento Bamboo Leaves ink on pink CS and cut with Labels 1. Colored flowers with Sakura Yellow Glaze Pen. That was it!. Easy peasy! Speedy the Cat's Friends Challenge: Use pink, yellow, and green in a card. This just fit the color challenge. My DH is my best critic....the response I got from him on this card was: "When are you going to finish it?" 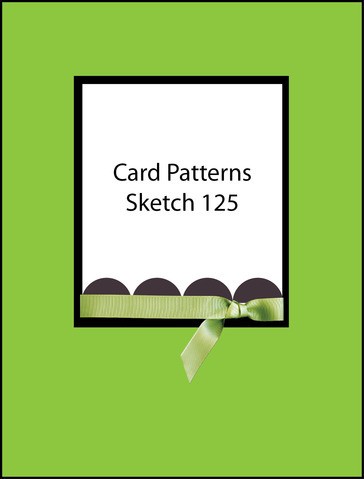 Well, this is my attempt to do a clean and simple card using a sketch from Clean & Simple challenge...maybe I should give it another try! But I will stand behind my card. 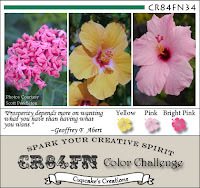 CR84FN: Color Challenge 34-yellow, pink, bright pink. 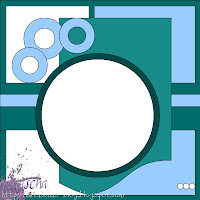 Less Is More: Theme is circles. It is sad when the graphics from the challenges out shine the card! LOL! 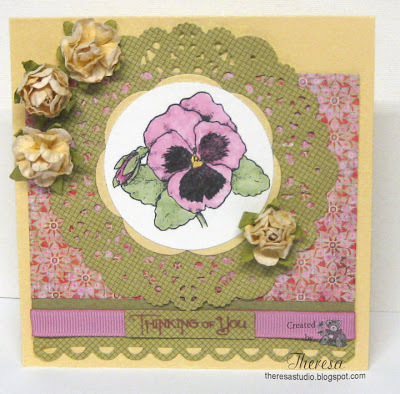 This is a quick card that I made for Flourishes Timeless Tuesday Challenge...right down to the wire with the entry. I made a square card which is smaller than I usually make...is 4.25X4.25". 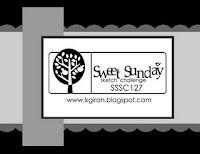 But I thought the size was good for the size of stamp and for the sketch that I used from STV's challenge. Found the perfect sentiment for the floral stamp. Flourishes Timeless Tuesday 126: Use embossing. I used stylized flowers on the lighter purple mat and highlighted the raised design with ink. Borders of flowers on the darker purple mat. Stamp TV: Mix It Up Monday...use sketch shown below. 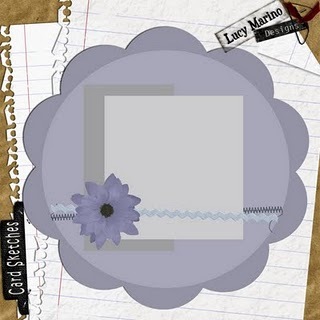 Papers: Graphics 45 DP, GKD Ivory CS, Bazzill Purples CS. I made this card featuring a Sassy Cheryl image but I do not know her name. I think I will just call her "Hattie". I colored her in shades of aqua and pink to coordinate with the designer papers. Colored a pearl to match and placed on the sentiment "Celebrate". Lollipop Crafts: Special Summer Challenge for July is Anything Goes but the sponsor is Sassy Cheryl so I used one of her images. Sassy Cheryl's Challenge Blog: Make your own paper ribbon. I used a strip of dotted paper for my "ribbon" and also added a bow. Critter Sketch Challenge: Use sketch #73 shown above. Well, I have done several posts today trying to enter several of the Monday challenges before time runs out. Guess it has been a good way to beat the heat! Hope you are staying cool. 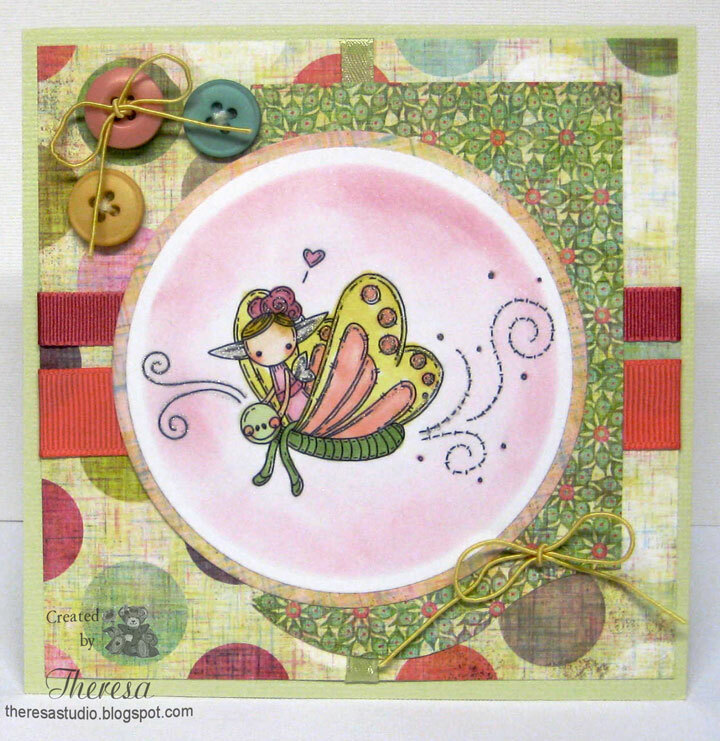 This is Flo ....I found her in my file of Digi's from Pollycraft and had forgot about her until I went looking for a stamp for The Great Outdoors challenge at Pollycraft Monday Challenge. I am sorry I have ignored her because she is the cutest gardener! She looks so pretty colored in purple and pink Copics and framed by purple dots on the pattern paper with flowers. I added a cut out flower with a brad in her fave color. It is too hot to garden today, so Flo and I are staying inside. 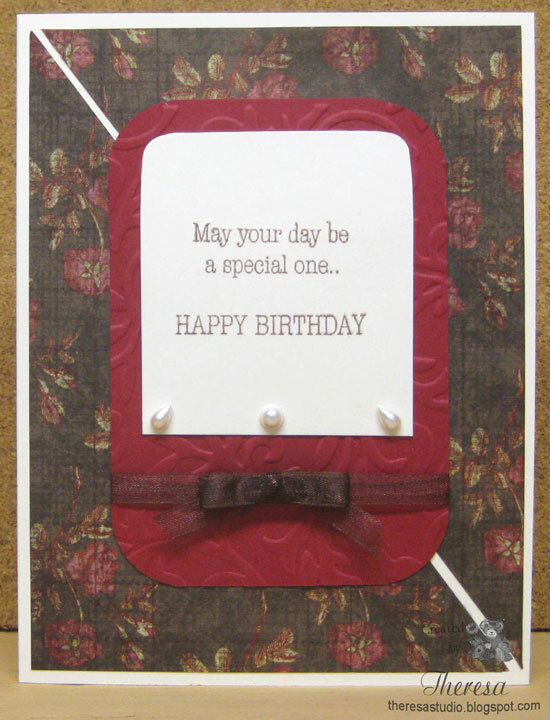 At There's Magic in the Air, this week Gloria ask us to make a birthday card of any kind. 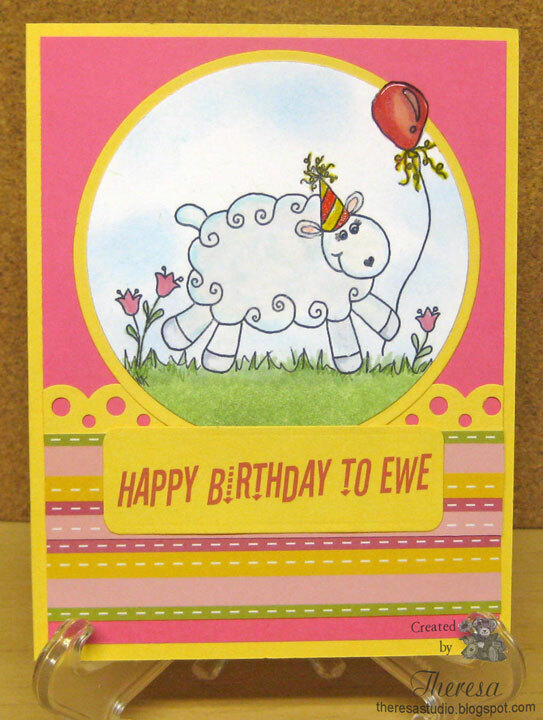 I used the "Merry Wishes" Lamb Image from Paper Cupcakes that I colored and cut with a circle die. I used a sketch from Sweet Sketch Wednesday. 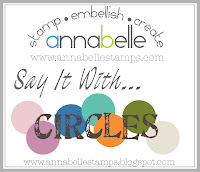 Stamptacular Sunday: Animal Antics-Create a card with some kind of animal. I have a Merry Lamb. 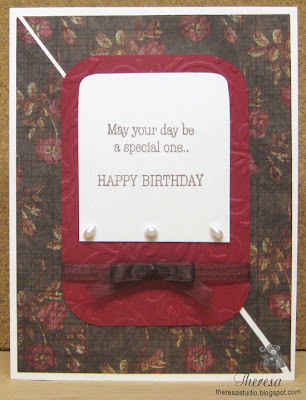 Digital Tuesday Challenge: Spellbound-use one or more dies in your creation. Used 2 sizes of Nesties circle dies. Ribbon tag die used for sentiment but trimmed ends. Paper Pretties: Use animal on card. Party Time Tuesday: Theme is Blue Skies and Sunny Days. I have a sunny sky and hope the yellow make it sunny enough on my Birthday Card. My layout is pretty much the same and I even tried to use similar colors. I embossed the background mat with 2 EF's to try to get the same embossing design and embossed the mat under the image to get that same look of polka dots. 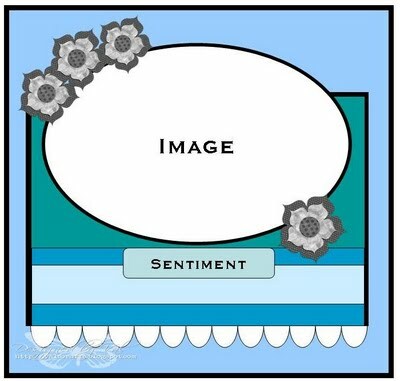 Flourishes Zinnia Stamp Set for the Zinnia image and sentiment. Used a sentiment from Garden Fresh to create the script background behind the flowers. Just stamped repeatedly ...very faint..hope it shows. This is one of my few attempts to CASE a card. Hope I did justice to Danielle's lovely card. Thanks for stopping by. Thanks for your comments. 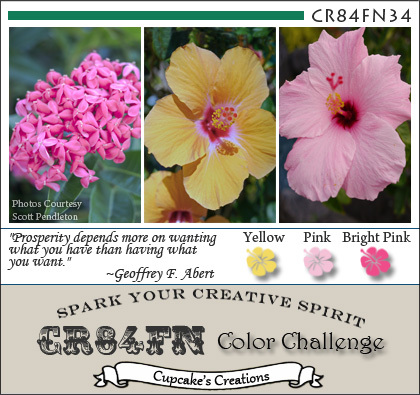 This card is for the July Bring Back Beautiful Challenge at Flourishes called The Beauty of Summer. This month the design team is challenging us to make a creation inspired by summer or a vacation. One of my favorites flowers in the summer garden is zinnia...it just screams summer with their beautiful bright colors. I love this stamp set by Flourishes which was released last month and I just had to have it! I used Copics to color the zinnia image and used a sketch from Stamptacular Sunday Challenge to highlight the zinnias. 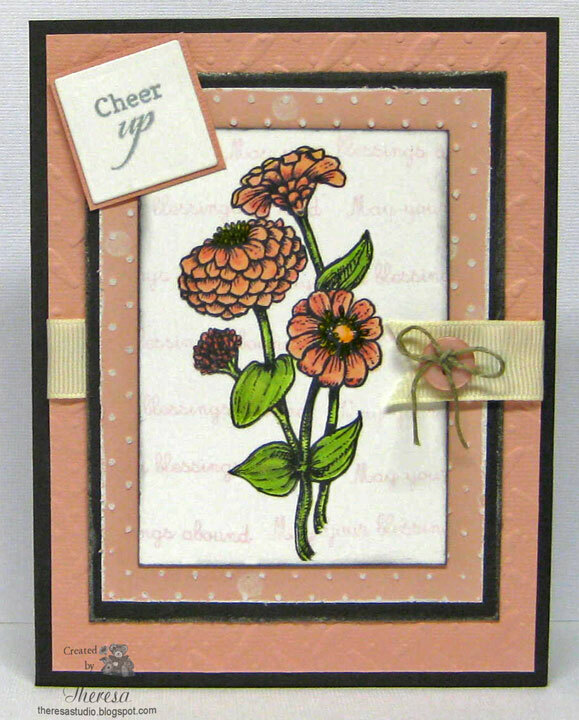 I also used the single zinnia stamp to create background paper. Flourishes Bring Back the Beautiful: Make a creation inspired by summer or a vacation. Stamptacular Sunday Challenge: Sketch shown below. Growing a garden makes a difference ﻿﻿in so many lives. Enjoy the summer flowers. 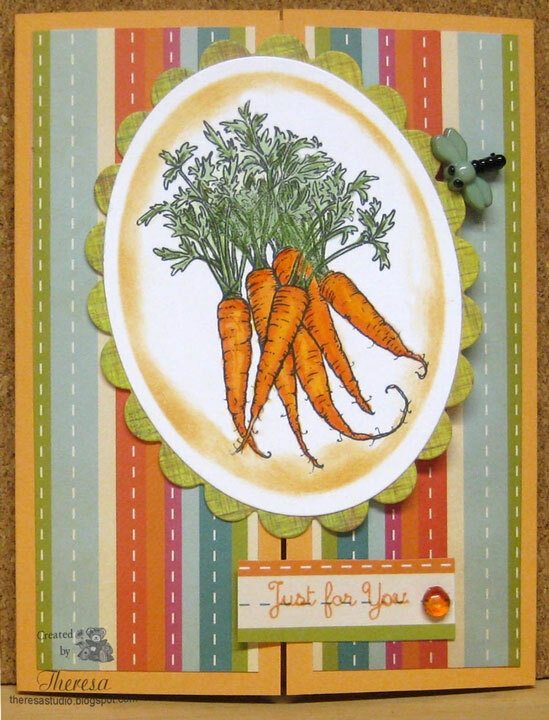 This card was made for the Farm Fresh Challenge at Flourishes- Use fruit or veggies as a focus. 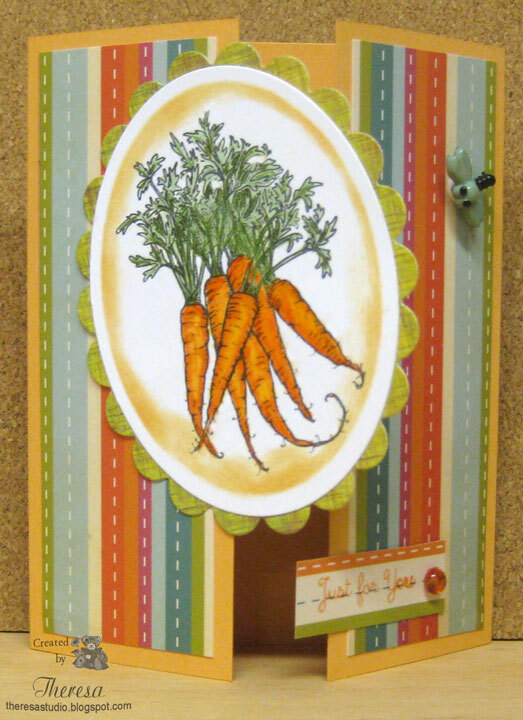 I made a gate fold card using the carrots and sentiment stamps from the Flourishes set "Garden Fresh" that I colored with Copics. 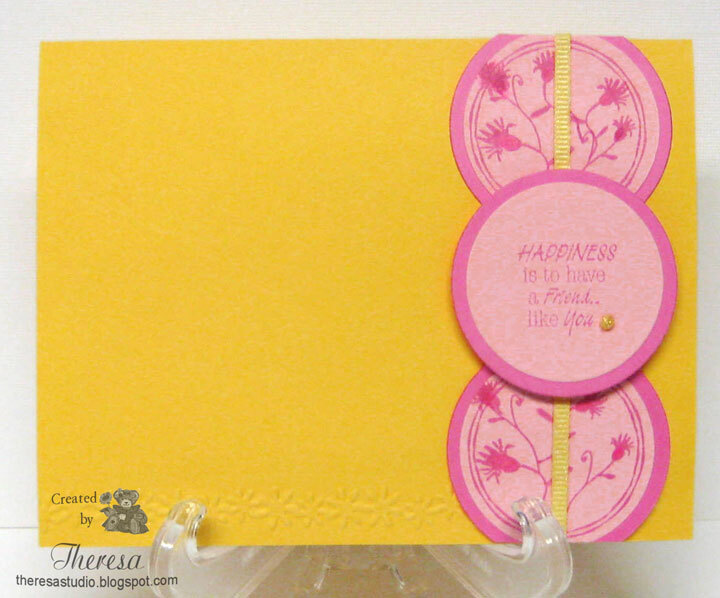 Added a dragonfly button to hold card closed and a dewdrop to the sentiment. This was a fun image to color. Craft Your Passion Challenge: Just for you. Stamp Something: Bugs and/or Butterfly Somethings. Anything with bugs or butterflies will work for this one. Use images, papers, or embellishments as long as we see at least one bug or butterfly. Craft Your Days Away Challenge: Fancy folds. Fab and Funky: Baker's Dozen ....feature food. 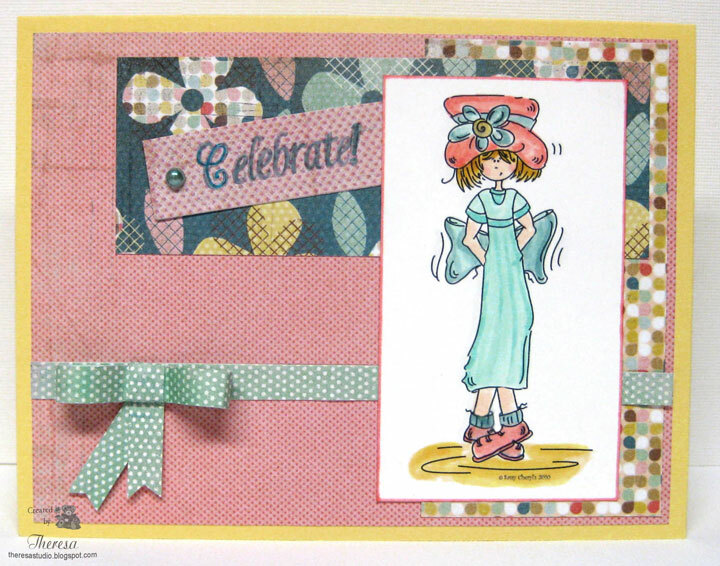 Flourishes is having another release of new stamps and fun challenges to celebrate their release. Play along and you could win Flourishes entire release for July by entering their sketch challenge shown to the left. My card is made with thier Morning Glories Stamp from a "Year in Flowers". I stamped the image and colored with copics and cut it out with Nesties oval die and matted with a scalloped oval (Nesties too) of Green Bazzill CS. I used a rectangle of BasicGrey Sweet Threads DP matted in green. 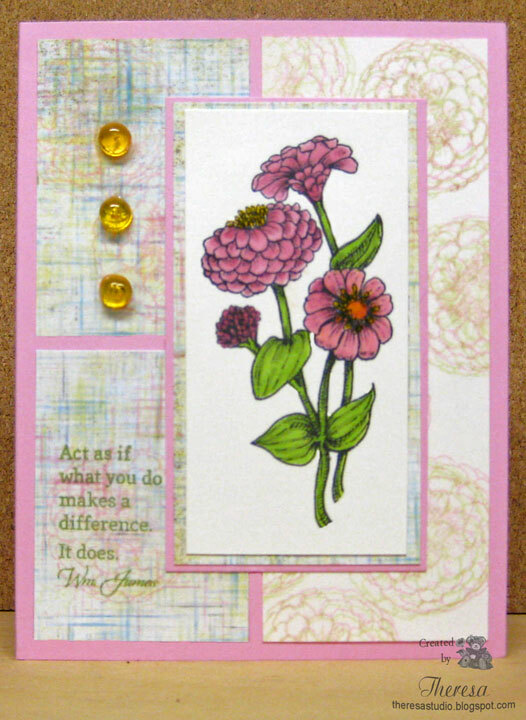 The sentiment is a stamp from Flourishes "Zinnias" stamped in Memento Rhubarb Stalk that I cut with Spellbinders Fancy Tag die and modified for my card. 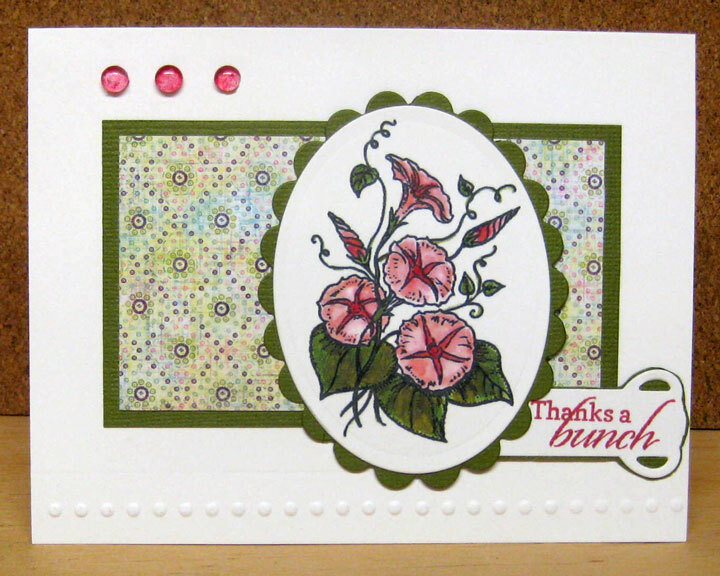 Attached all to a card base of GKD Ivory CS and finished with some pink Dew Drops. Embossed a row of dots along the bottom with Cuttlebug EF. 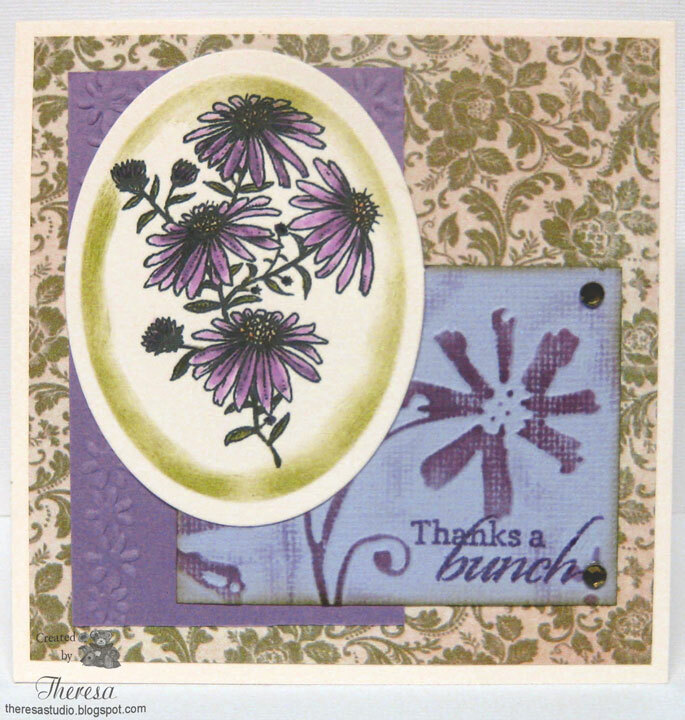 Hope to win some new stamps from Flourishes, one of my faves. 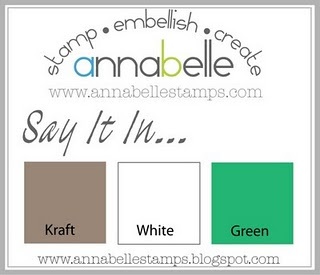 Annabelle's challenge this week is Say it in...kraft, white, and green. 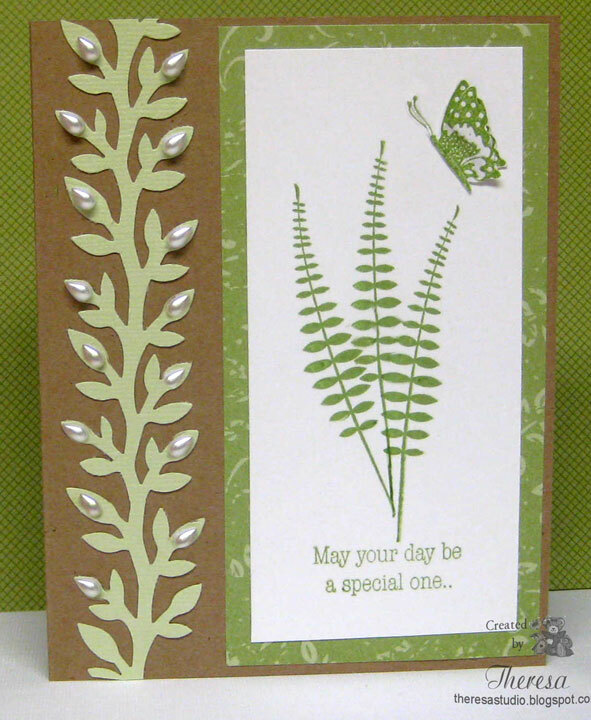 I stamped 3 ferns and a sentiment below the ferns using stamps from Annabelle's "All Things Grow" set. I used Bammboo Leaves Ink from Memento. I stamped the butterfly twice and cut out, layered and attached to the corner. I adhered the image to a mat of SU DP and attached to a card base of kraft CS. Added a vine cut out with a Martha Stewart punch Vine Trim and finished with Annabelle pearl teardrops. May your day be a special one! What kid does not like ice cream? So I thought this would be a good theme for a kid's birthday card. 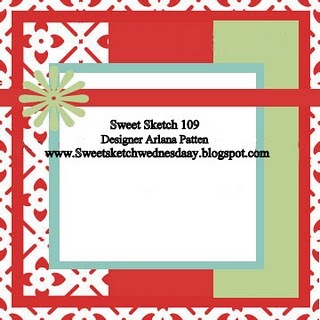 The digi paper is from 100% Sweet Digital paper pack and the template is 100% Sweet Cupcake Template both from the Freebies offered at Stamp TV. Actually I enlarged one of the ice cream cones from the digi paper and cut it out and added some glitter with a clear star pen but you could use the template. Attached the cone to some pink CS and cut out with scissors. The Happy Birthday sentiment stamp is from GKD "Candles on Your Cake" by Melanie. 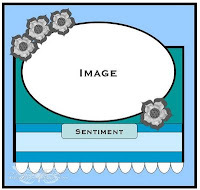 The other sentiment is from Raindrop Echo Designs that I downloaded as a freebie from Sentimental Sundays blog. Used Decorative scissors to cut sentiments before matting on pink CS...the same CS as the card. base. Thought this was good use of some free digital downloads. Inside will read: "You're so Cool! Happy Birthday!" Stamp TV: Free For All Friday Challenge is to make a Kid's Birthday card. 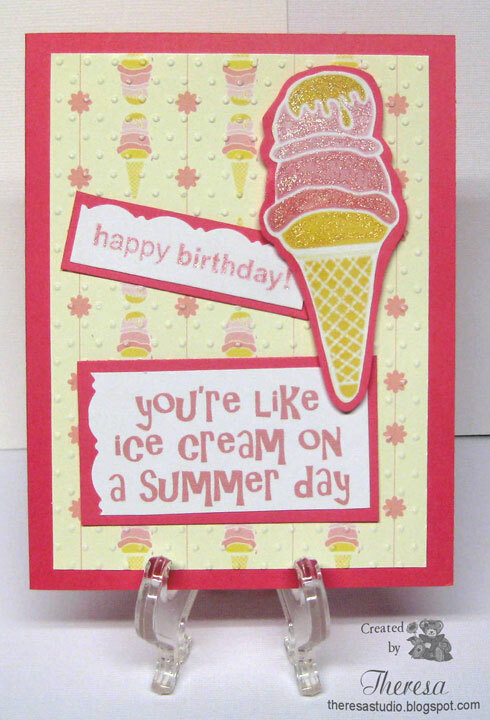 Paper Cutz Challenge: Make a card using a Cricut cut, hand stamped or digital stamped image of an ice cream cone, popsicle, ice cream sundae or milk shake. Kaboodle Doodle Challenge: Use your scissors. Use scissors to trim out Cone and mat and also used decorative scissors. Fab & Funky Challenges: Baker's Dozen....feature food on your project. What's more fun on a hot, sunny summer day than eating a slice of cold watermelon? That's what this ant is thinking as he steals away with the watermelon in a digital image by Meljens. 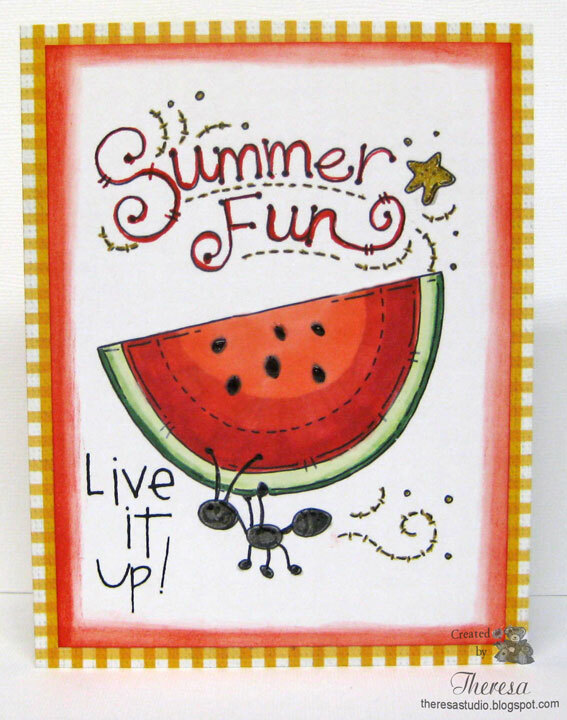 I also used her "Summer Fun" sentiment and added a Making Memories sticker to complete the message of the card. I colored the image with Copics, Gold Atyou Spica Pen, and markers. Added some glossy accents to the seeds, star, and ant. This is only 2 layers...card base of DCWV Yellow and White Check DP and the image printed on White CS that I edged with Distress Ink Barn Door to look as if there is a mat. Have a fun summer day! Billy the Cowboy by Meljens is a a great image for the "Wild West" theme challenge at Cards for Men. I used a great sketch from Sweet Sketch Wednesday for the design. I printed Billy on white CS and colored with Copics and pencils and sponged with Distress Inks Wild Honey and Tea Dye. Almost did too much distressing. 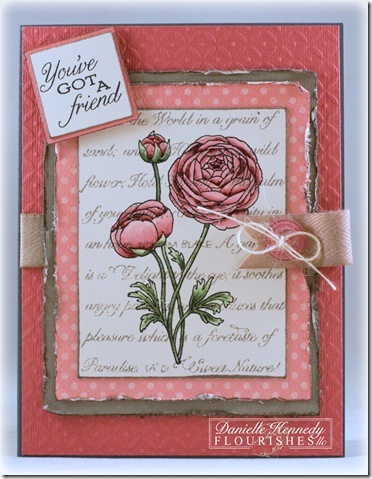 Used DP's from Nikki Sivils "My Friend Birdie" pack, card base of green texture CS and mat of brown CS. I finished with some Stickopotamus stickers that I have had forrreeever - from a garage sale buy??? Stickers are the badge, boots, stars, cacti, wagon wheel, wanted poster, "Cowboy" and lassos. Used the lasso stickers across the card instead of ribbon or stripe shown on Sketch. 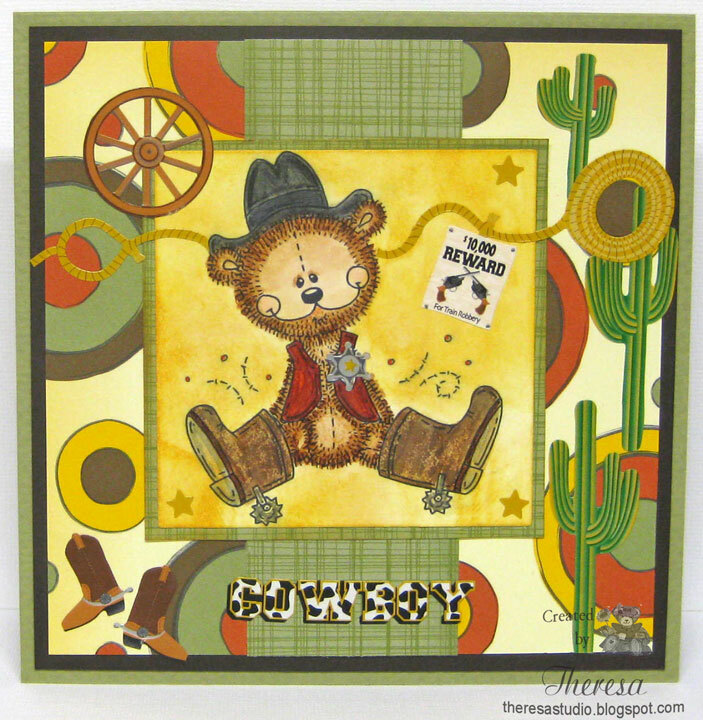 Sweet Stamping Challenge: Cute and Cuddly...think he is a cute, cuddly sheriff?